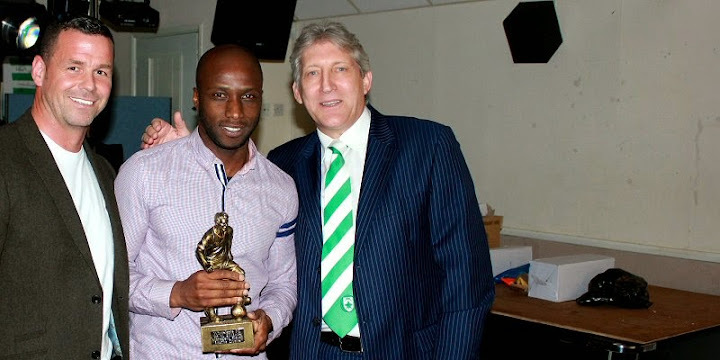 Whyteleafe celebrated the end to their successful season in the customary fashion with the Player of the Year Awards and party. There were numerous awards given to players from both Stuart Massey’s Youth team and John Fowler’s 1st team. The evening kicked off with a speech from Chairman Mark Coote who was very careful to thanks everyone who has contributed to such a marvellous season for the Leafe. Mark then handed the mic over to Stuart who presented his player of the year awards to Ollie Thornton and Ryan Gondoh plus made special presentations to Ollie, Jay Massey and George Oakley who he has continually coached since they were six years old. Vice Chairman Paul Owens then made two special presentations to two loyal Leafe fans for their contribution to the match day humour. Tim Deadman was awarded an orange hi-vis jacket for his Guantanamo Bay song aimed at orange-kitted Lordswood and Fisher. Adam Willmott was presented with a large bar of Toblerone for his Toblerone cat-call following various wayward goalkeeping clearances. A tremendous evening was enjoyed by all. A selection of photos from the evening.